WiBox" dual port device servers enable you to connect equipment to 802.11b/g wireless networks via serial or Ethernet, quickly and easily. 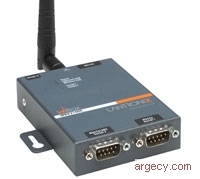 By merging wireless communications and Lantronix device server technology, WiBox simplifies connectivity to devices in applications where mobility is required or cabling is impractical. Lantronix's innovative approach to network-enabling devices is transparent to your attached devices and software. You won't need to change the way you work, and there's no need to develop special software to take advantage of wireless networking capabilities. The WiBox simply becomes a conduit between you and your device over your network or the Internet. The Com Port Redirector software included with your WiBox simplifies your integration process by extending the functionality of your COM port-based Windows" applications. With virtual COM ports mapped to remote device servers on the network, you can replace direct serial connections. The DeviceInstaller configuration software that's included simplifies installation and setup. WiBox can be set up locally through its serial port, or remotely over a network using DeviceInstaller Telnet or a web browser. Flash memory provides maintenance-free, non-volatile storage of web pages, and allows future system software upgrades. If you're looking for a transparent, cost-effective and scalable means to network-enable your serial devices, look no further than WiBox from Lantronix. Built into the included Com Port Redirector software, TruPort" technology enables Windows-based applications to access and control serial ports on the WiBox as if they were actually local PC serial ports. The application can monitor and set hardware pins on the WiBox serial ports as well as access serial buffers for total Com port control. This allows existing applications to seamlessly transition from controlling local devices to true remote monitoring and control of devices around the world. Windows" 98/ME/NT/2000/XP-based configuration software, Com Port Redirector software, related utilities, Quick Start Guide.